Say "you go, girl!" with the brunette female track and cross country personalized Christmas ornament from Russell Rhodes. These nicely designed sports ornaments personalized with hand-painted letters are fun gift ideas for casual and competitive distance runners too. 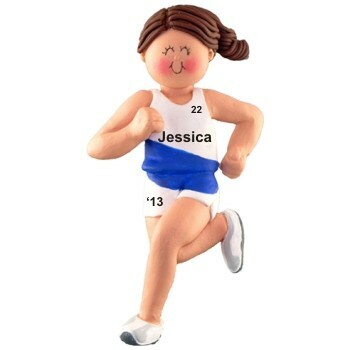 A display ribbon is attached to the cross country / jogging female brown hair personalized Christmas ornament that is offered in other male and female versions for the entire team. Each one arrives in our exclusive velvet drawstring gift pouch.